The NX Group operates within the Midlands’ so-called ‘Golden Triangle’ of logistics. Spanning from Northamptonshire up the M1 to East Midlands Airport, and West as far as Tamworth area, the Golden Triangle is bursting with logistics names. As well as being in proximity to the huge distribution centres of supermarkets and high street stores, Midlands-based supply chain companies enjoy access to over 90% of the UK population within 4 hours drive. As well as the giants of UK haulage, smaller independent logistics companies are also numerous in this area; typically based in logistics centres like Magna Park, DIRFT and Eurohub. Proximity to major motorways, notably the M1 and M6, means that major cities such as London and Manchester are not difficult to reach from the Golden Triangle. The other advantage of being based in the Midlands is that it’s not London! The capital city may be the epicentre for arts, finance and the legal profession; but it isn’t necessarily somewhere you’d choose as a base for a logistics operation. Aside from being less accessible to the North and Scotland, London’s huge demand and scarcity of property means rental for a typical premises is much more expensive than the heart of England. It’s no surprise therefore, that the Midlands has close to 150million sq ft of warehouse space; more than twice the combined warehousing activity of London, Scotland and Wales. 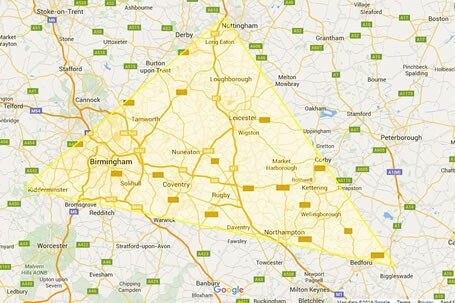 There is no official and precise measurement of exactly what constitutes the Golden Triangle, but it pretty much covers Leicestershire, Northamptonshire, Warwickshire, plus parts of Staffordshire and Derbyshire. 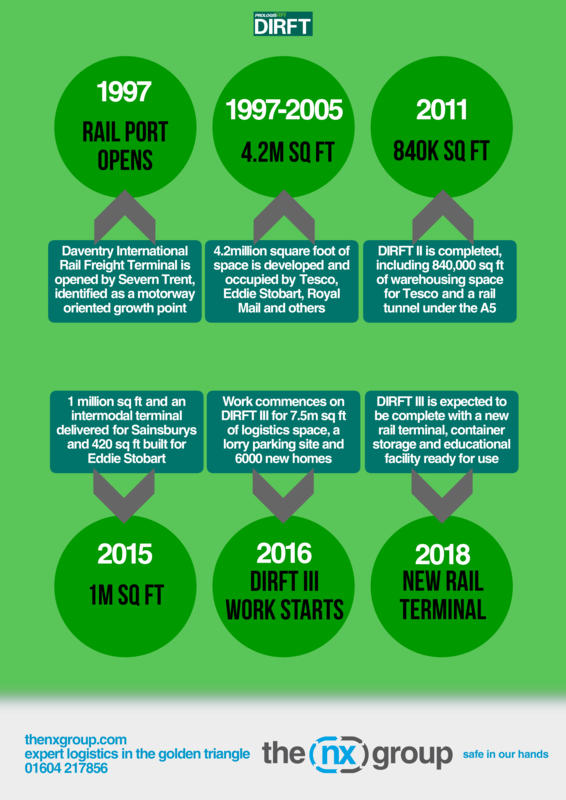 Daventry International Rail Freight Terminal (DIRFT) contains 1million sq ft of Tesco warehousing space, and rivals Asda have several units less than 20 miles away in Magna Park. When you throw in Birmingham International Airport and East Midlands Airport (which itself contains a freight hub) plus the various rail links to the UK’s ports, the Midlands begins to look more and more like the natural home for the nation’s supply chain. Discover how the Golden Triangle has continued to expand in the latest blog post here.